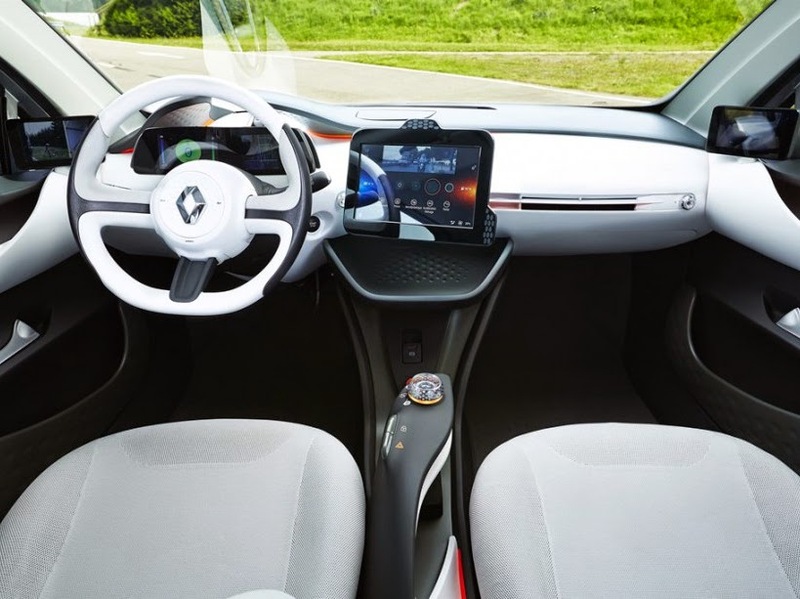 For Renault 1 Liter per 100 Will Be Possible In 2025 - NEW CONCEPT CAR Renault promises not only to sell a car consuming 2 liters per 100 km by 2020, but announced to do twice as well, five years later. Render unto Caesar that it owns. It is in light of the progress of the project PSA Peugeot Citroën for ultra low power car that the French government decided two years ago to fund the "Car 2 liters per 100 kilometers program marketed to 2020 "conducted by the Automotive Industry Platform (PFA), and not the reverse. That's why it took less than a year to PSA to follow this Government's commitment to the presentation of a Peugeot 208 FE Hybrid prototype at the IAA 2013. The extreme degree of innovation, the perfect integration of mechanical proved that his study had started well before. 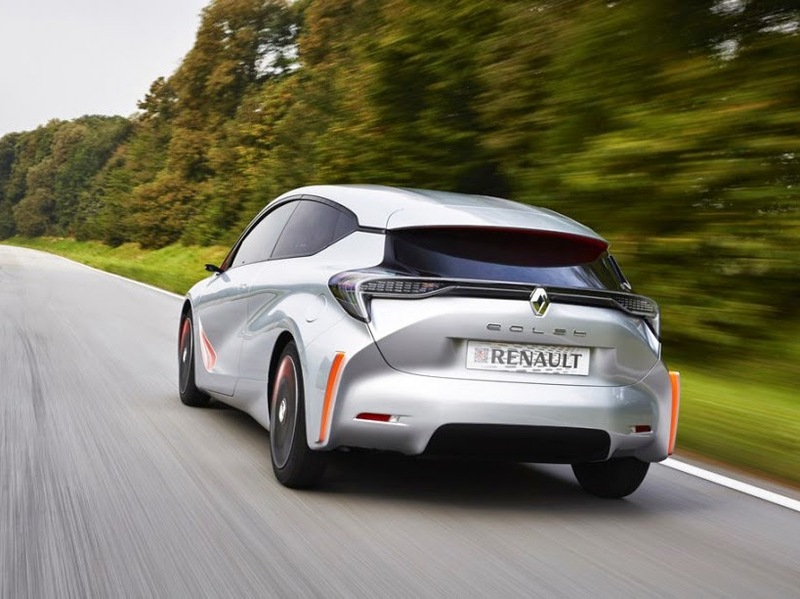 Renault seemed to be lagging behind, he was engaged in its ambitious propulsion program 100% electric car model. To catch up on the media plan and confirm that hybridization gained citizenship in Guyancourt, the company reveals to the diamond on the occasion of the 2014 edition of the Paris Motor Show a prototype dual Renault EOLAB gasoline-electric powertrain that aims not an average consumption of two liters per hundred kilometers in 2020 but only one liter at a "10-year horizon." A little before 2025. Electric hybrid "low-cost". It would be unfair to bring this ad blaring a simple bidding contest for the two manufacturers plan for their projects of medium-term industrial benefits. The Peugeot 208 Hybrid Air 2 The experimental wants the latest evolution of the dual drive system gasoline / air What market PSA Peugeot Citroën in five years, with the financial support of its Chinese partner Dongfeng Motors. As for Renault, if he chooses the most conventional way of the small electric motor to browse sixty kilometers without seeking 3-cylinder petrol 999 cm3 of 75 horses, he established there "a breeding ground for the design of future vehicles" offering "benefits and cost of ownership comparable to that of the Clio" today for ultra low power consumption. This is probably because it is a more distant term time that Renault EOLAB dresses unprecedented and futuristic body, where the Peugeot 208 Hybrid Air 2 L strives to preserve the silhouette of the current 208. But the one and the other are synonymous with technological breakthroughs. In fact, no solution has been ruled out for achieving the ambitious goal (some would say amazing) an average consumption of one liter per hundred kilometers which is double the condition of a selling price "affordable" equivalent to that of a Peugeot 208 or Renault Clio in 2020. it is the necessary condition for the "Car 2 l / 100 km" desired by the government really serve "as a catalyst to remain competitive" and allow french manufacturers "to widen the gap and pick up where they lost market share" (according to the Ayrault and Montebourg Ministers last March). The relief, the mother of all virtues. It is therefore not surprising to see a dizzying variety of advanced materials used by Renault to limit the mass of its experimental EOLAB to 955 kg (860 kg against for the Peugeot 208 Hybrid Air 2 L). This is more or less 400 kg less than the average of the same size vehicles marketed at present and 20% less than the Clio IV. 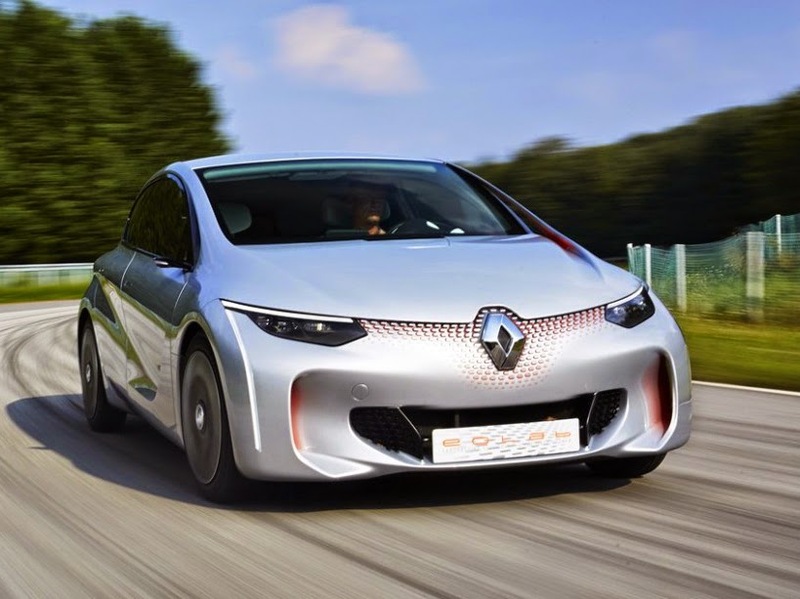 Renault EOLAB (World 2014) 1: lowering the flag; 2: constricted behind; 3: sharp edges on the back; 4: rearview cameras by; 5: air curtains; 6: narrow tires profiles; 7: front spoiler deployable; 8: controlled suspension; 9: aerodynamic hubcaps assets; 10: deployable rear shutters; 11: underbody fairing. All methods are good: the structure of various steels and aluminum, magnesium pavilion of just 4.5 kg (provided by Posco), thinned glazed glass or polymers (Saint-Gobain), still finer seats and trims (Faurecia), etc. This drastic reduction initiates a virtuous circle that allows the reduction of the size of the motor, the battery capacity as the tank, reducing the size of the wheels and tires (Michelin) and brakes (Continental). Much savings should, Renault sufficient to offset the cost of materials and pull prices down through mass production. 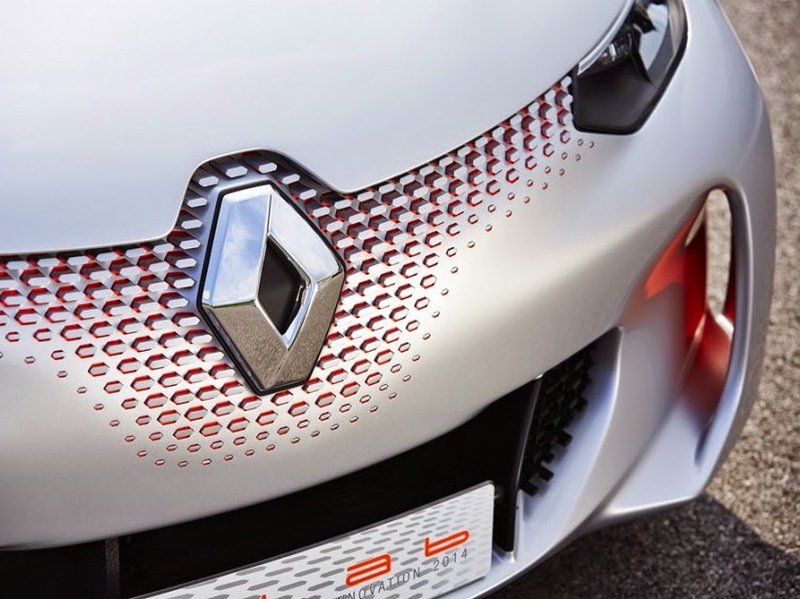 Renault EOLAB (2014 World Cup) Architecture rechargeable mechanical hybrid gasoline-electric . Under the hood, there is an example of what Renault calls "Hybrid technology ZE" which will complement ZE models 100% electric car model propulsion in the coming years. Behind this name hides the union between a conventional combustion engine and an electric machine used sometimes to recover kinetic energy to propel the craft. According to Renault, a lithium-ion battery 6.7 kWh is sufficient to cover sixty kilometers (up to 120 km / h) in all-electric mode. This battery is recharged by rolling or by connecting a cable to the sector stopped. Seated against the robotic clutch, the electric motor with permanent magnets 50 kW and 200 Nm is coupled to both the first reports of a box which has three. Only the latter is directly driven by the gasoline 3-cylinder, allowing no less than nine combinations of electric and hybrid modes. Renault claims to be that way the change continuously offered by a CVT, while matching the liveliness and efficiency of a dual-clutch automated gearbox, heavier and of course more expensive. "Today most of the market hybrid Car vehicles are higher segment, which have higher selling price at 40,000 euros. The solutions adopted on EOLAB are much more economical and allow to consider a spread of hybrid small cars, on a much larger scale. Our goal is to make a car with two engines at the price of a single motor, "said Jean-Pierre Fouquet, ZE Innovation Project Manager Hybrid. Renault EOLAB (2014 World Cup) Skins and equipment optimized for the Renault EOLAB. The relief does not explain by itself the sobriety of the Renault EOLAB. The improvement in aerodynamic drag by 30% (from 0.470 SCx m2, 0,200 m2 of less than the current Clio) allows a reduction in consumption of 1.2 l / 100 km at a constant speed of 120 km / h relative at the same Clio. This game of cat and mouse with the wind speed implies the disappearance horrible appendages that are the mirrors (replaced by video cameras), full underbody fairing, the variation of the ground-based care speed the deployment of various spoilers and ailerons and mobile occlusion driven wheels as brake discs do not require additional cooling. Michelin manufacturing has meanwhile worked to reduce resistance to the advancement of 15% compared to the best time of Clio, while Continental was developing brake discs which do not waste valuable kinetic energy against the continued licking the plates. The list of innovations would be too long to train here. They nestle into the most unexpected corners, in the image of these external elements that lighten few grams by adopting an air bubble bursting plastic, dressed in a flattering appearance of skin. "If they are only the weigh a few hundred grams each, and these dressing rooms butted still represent 10 kg on a production car by including the lining of the chest," said Laurent Taupin, Project of EOLAB . "Our strategy can be summed up in these words: put the right material in the right place This is essential when you want to lighten a car while guaranteeing an affordable selling price. ".